This is a fall event that the whole family will enjoy, from young children to teenagers. There’s something for everyone, from those who love fall treats like caramel apples or apple cider slushies to those who want to be spooked on the scarecrow trail or hayride. Scare-free hayrides are perfect for young families, ages 3 and up. Those with a braver heart can attend the spookier version of the hayride later in the evening. Teens especially will love the Scary-o-kee tent as they sing along to haunted favorites or visit the mystic to have their fortune told. New this year, don&apos;t miss the seven-acre corn maze with scarecrow scavenger hunt. See it from above with a ride in the 1859 Balloon Voyage, weather permitting. Plan to dress for the weather. The event takes place outside so you’ll need layers to help keep warm as the sun goes down. If you buy your tickets ahead of time, make sure you have those and a little extra spending money to grab a yummy caramel apple from the Apple Store. Families are welcome to dress in costume as well. You can begin lining up at 5 p.m. and staff will direct to you to the first come, first serve free parking. Gates are open from 6-9 p.m. and scare-free hayrides begin at 6:15 p.m. and run until 7:30 p.m. After dark, a more thrilling version is available for those looking for a bigger scare. Some activities may last until 10 p.m. It is highly recommended that you arrive early to get in line. Feel free to bring snacks or purchase treats from the Apple Store to munch on while you wait. Note that you can select your hayride time upon entrance, but you must still line up in your time queue inside. Want to skip the lines? Upgrade your membership for Express Passes to avoid the lines! Take a stroll down the spooky scarecrow trail, meet some friendly ghouls who are running for mayor of Conner Scairie, or check out the games, marionette show and feast on fall treats at the Apple Store. Of course, you can’t miss the hayride and a visit from the Headless Horseman himself. • This is the 34th year for Headless Horseman? • Many of the props are made in-house at Conner Prairie and preparation begins in July? • There are 15 Headless Horseman riders and 11 are female? • They use close to 200 hay bales for the event? 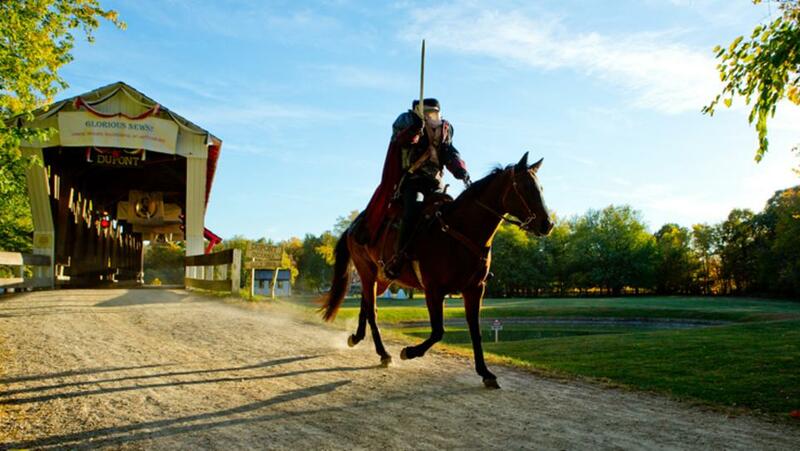 Have you been to Headless Horseman at Conner Prairie? Share your tips in the comments below. Don&apos;t forget to follow us on Facebook, Twitter and Instagram for more fall fun in Hamilton County, Indiana.